As you may know, I have started a little business. One of the main things I’m currently making a lot of is slippers (aka unicorn riding boots). I’ve made them in adult and child sizes, and used several different yarns. Even though I don’t normally review yarns, I thought a little post might be useful as I’ve noticed a few differences between the yarns as I’ve been using them. The pattern itself calls for a yarn with nylon content, as it needs to be hardwearing. However, I decided (bravely or stupidly, I’m not sure which) to use acrylic yarn for children’s slippers as they are likely to be outgrown before being worn out. I chose James C Brett Marble for this job as I liked the colour changes. I was also asked to make another pair of child’s slippers with a more ‘luxury’ feel so I went for Drops Lima, which is 65% wool and 35% alpaca. For adult’s slippers, I chose West Yorkshire Spinners Aire Valley DK, with a 75% wool content and 25% nylon. As you can see, all three yarns are very different! This yarn has some really nice long colour changes, and so lends itself well to crochet (some other brands of yarn with shorter colour changes only give a few stitches before changing, and the effect isn’t always pleasing). It has a tendency to go fuzzy quite easily, so isn’t particularly good if you make a mistake and need to frog your work. I also found it a little too easy to split, possibly because of the different strands of colour being plied together. However, it was still quite pleasant to work with (it has the usual acrylic ‘squeak’) and produced quite a nice finish. I used a 4mm hook and it seemed to be about right-some DK yarns feel very thin and need a smaller hook, which then interferes with the gauge for the pattern. It is very good value for money too, coming in at £2.49 per 100g ball, which is enough for 1 pair of child sized slippers. Because acrylic is easily washable too, I decided it would be a good choice for slippers for children. I’m going to start by saying this yarn is beautifully soft, and you can tell straight away that it is ‘real’ wool. It crochets up really well, and gives lovely stitch definition. It is a little ‘hairy’ but you expect that from wool. When working with it, it is easy to split, but pulling back the offending stitch and reworking it carefully left no trace of the loops split stitches cause. It is quite thick for double knit too, so it suits a 4mm hook perfectly. I’m not sure it would be suitable for adult’s slippers, because it doesn’t have any nylon in. However, the pair that I’m making with it are intended for occasional use by a child so I think it should be hard wearing enough. At £2 per 50g ball, it works out more expensive than acrylic (as you’d expect) but is still quite good value for money. (Around £4 for a child sized pair of slippers.) I’m not sure on how washable it is, but I wouldn’t choose it for items that needed very regular washing as I’d be too nervous to machine wash it and handwashing is a bit of a faff to do very often. Slippers made using James C Brett (above) and Drops Lima (below) I love the way the stitches look in Lima. This is the most expensive of the three yarns I’ve used, at £4.79 per 100g (block colours) and £4.99 per 100g (prints). It is also the most suitable for adult sized slippers as it is 25% nylon and should therefore stand up to a reasonable amount of wear and tear. When I first used this yarn, I wasn’t keen. It was very hairy (and not even the nice kind). However, I got used to it quite quickly and could see how the ‘hairiness’ was actually useful. I’m probably so used to acrylic that the properties of ‘real’ wool are still foreign to me. The print yarn had short colour changes, so I wasn’t that happy with the appearance. However, when working in the round it pooled quite pleasingly to give a purple ‘camo’ effect. Not to everyone’s taste but the recipient loved them! I would only hand wash items made with this yarn too, just in case of machine mishaps. The block colours feel softer than the prints too, which is interesting. I’m very much enjoying exploring different yarn types, and I have a feeling that there’s more to come. It has been interesting to see how the same pattern looks when worked in different yarns. Also, I don’t really have a ‘favourite’ as they’re all useful in their own way. I’d like to explore different yarns with nylon content for making these slippers too, but I’ve found it hard to buy DK weight in colours that I like at a price that I also like! Which new yarns have you explored lately? Have you found any new favourites? Aren’t they slippery on floors? I apply sock stop to the soles (you can just about see it in the photo of the purple ones). It’s amazing stuff. Lol, no, even the grown ups get it on theirs! All of the slippers look cosy. I love to hear about people’s experiences with different yarns. Thank you, I find it helpful reading the experiences of others before buying too, especially if I can’t get to a yarn store to test them out. Thank you, it comes in rainbow colours too which is definitely choose for me! The only one of these yarns I have used is the first the Marble. 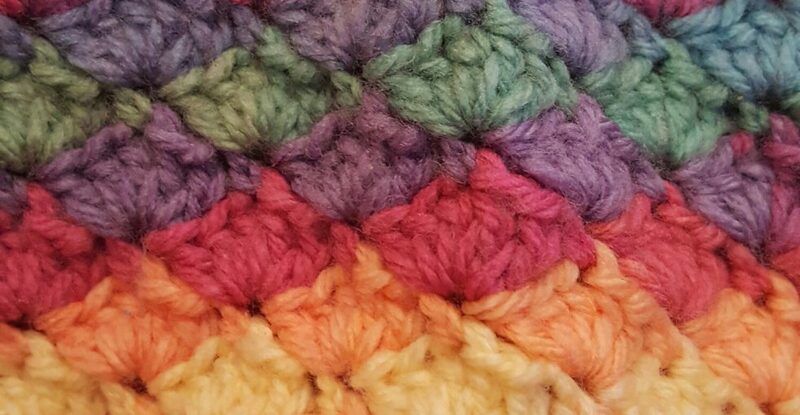 I used a green one for joining the sqaures on a crochet blanket, it was to create a summer garden feel and it worked brilliantly for this purpose. I really like your purple boots. Thank you, the marble comes in a gorgeous range of colours doesn’t it! I can imagine the green looked amazing. Good luck on your business! Those slippers looking so comfortable. Love the colors. You know how I feel about these ahhhmaaaazing, magical bootees, so I don’t need to use the word Incredible Creations. I’m just thrilled to pieces that you’ve finally made it to business class! You may have already seen these, but … I saw them and instantly thought of you so I’m dropping a message in here so that it kind of relates to something bootee wise. They were just too cute to not share. Once you’ve taken a look, feel free to delete this message and then we can both deny of ever seeing these. LOLOL. My new favourite fibre is cotton. Never worked in cotton until recently but it is so lovely! It’s a lovely yarn, but again a bit splitty! I get so annoyed with splitty yarn!